The highly-acclaimed and popular “Kingdom Hearts” series has been running across multiple platforms for almost fifteen years now, from developer Square Enix and publisher Disney Interactive Studios. And today the partnership between companies announced the latest expansion and relaunch of their successful “Kingdom Hearts: Unchained X” mobile RPG. 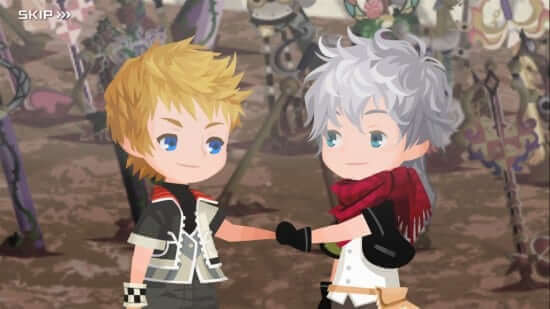 The free new update, which will rebrand the game as “Kingdom Hearts: Union X[Cross]”, offers players a new multiplayer mode and more ways to customize their avatars. Be sure to pre-register for the update, which launches soon, at Square Enix’s official website. Fans can also visit the Square Enix booth at the video game convention PAX East to get a sneak peek at the new game update, plus special button and poster featuring the artwork by Tetsuya Nomura.